Whatever your pace. Whatever you desire in a vacation destination. Waikoloa Village Villas has all that you can ask for and more! Guests will have access to the Waikoloa Village Tennis Club and the Waikoloa Village Golf Club, discounts are available via the owners Waikoloa Village Association Amenity Card. The Villa is the perfect "base camp" for all your activities on the “Big Island” which will exceed and enhance your vacation lifestyle. The Waikoloa Villas are located in the foothills above the Kohala Coast in the town of Waikoloa Village. This recently remodeled immaculate villa is located in the foothills of the Kohala Coast and comprises of two bedrooms, two bathrooms, and can accommodate up to four guests in privacy and comfort. The main living area boasts an open floor plan, making the home perfect for entertaining or relaxing with family and friends. The living room is decorated in Asian-Island decor and is inviting and soothing, and the expansive bank of windows gives the space great views of the golf course and the tropical landscaping. Adjacent to the living room is a private dining lanai that features distant ocean and golf course views, and a dining table with seats for four. The kitchen features granite countertops that complement the beautiful mahogany flooring and the custom cherry wood cabinetry. High-end appliances will please any chef and make meal time a breeze. The breakfast bar seating provides a casual dining space and joins the dining area that has seats for four. There are two bedroom suites; one is located on the upper-level and features a king-sized bed and an attached bathroom, and the other located on the plaza level with a queen sized bed and a private bathroom. Also included is; basic cookware, dishware, drinkware, coffee maker, blender, washer/dryer, hairdryer, bed and bath linens, iron, wireless service, basic cable TV. There are beach chairs, boogie boards, cooler and umbrella as well as beach towels for your use. 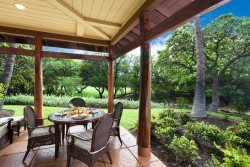 The complex is at the ideal elevation for comfortable living and sits on the 9th fairway of Waikoloa's Robert Trent Jones designed golf course. The tropical saltwater and heated pool with lounge chairs, tables and umbrellas is nestled in the lushly landscaped grounds securing your feeling of privacy and luxury. There is also a hot tub and an onsite fitness room with workout equipment. Waikoloa Beach Resort is approximately 7 miles away. A pedestrian friendly resort with two outdoor shopping centers, Queens’ Marketplace and Kings’ Shops, Hilton Waikoloa, Waikoloa Beach Marriott and Anaeho'omalu Bay (A-Bay). A short 15 minute drive away, enjoy the white sand beach of Anaeho'omalu Bay which offers many water-sports from this picturesque beach along with the very popular restaurant Lava Lava Beach Club. Water sports include windsurfing, swimming, sailing, snorkeling, glass-bottom boat, dive trips, whale watching trips, etc. We also offer full concierge service to make your trip perfect. PLEASE NOTE: The hot tub/jacuzzi is heated after 3pm each day. Prior to 3pm it is not heated.